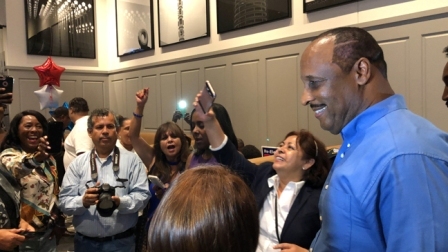 Inglewood voters gave their seal of approval to Mayor James T. Butts in his bid for re-election with a resounding landslide victory over his opponents. With all precincts reporting, Butts is showing an insurmountable lead over his opponents, including New York financed Republican Marc Little. Butts’ win returns him to city hall for a third term representing the city of 110,000. Among his recent accomplishments, unemployment in Inglewood is down from 17.5% to 4.8%. Crime is down to its lowest rates for the eighth consecutive year. Under Butts’ administration Inglewood opened a $27 million, 35,000 square foot state-of-the art Senior Center in January that had been promised to Inglewood seniors since 2006. In just four years, Butts has negotiated the reopening of the Forum along with the return of the NBA to Inglewood and the NFL back to the L.A. media market with construction of a stadium in Inglewood. He negotiated the move of the L.A. Philharmonic Youth Orchestra program to Inglewood and the Girl Scouts of Greater Los Angeles. In 2020, the NFL Network will call Inglewood home followed by Super Bowl 54 in 2022, the NCAA Championship Football Bowl Game in 2023 and the opening of the Olympic Summer World Games in Inglewood in 2028. Mayor Butts has a combined 39 years in public safety, municipal government and education. He is the 12th mayor of Inglewood.